Yesterday, November 5 was the feast day of St. Elizabeth and Zachery, the parents of St. John the Baptist. Yesterday, the focus of our blog was on Zechariah, (today we will concentrate on Elizabeth). 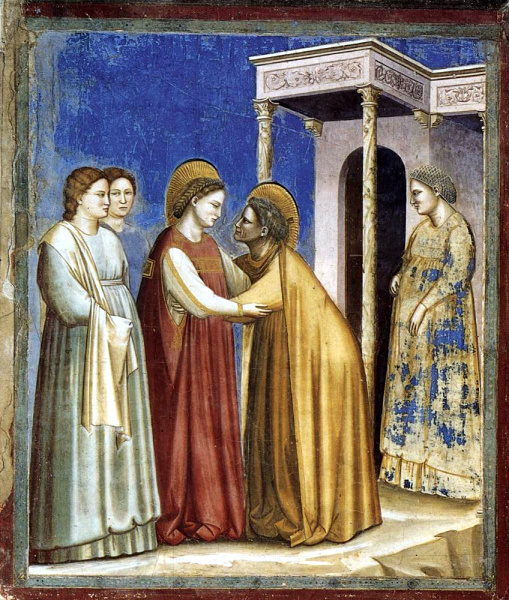 The account of Mary’s Visitation to Elizabeth (and her unborn baby John) and Zechariah, is found in Luke 1:38-57. Elizabeth seems to have been awestruck by the immediate revelation she received at this moment. Some people would be similarly overwhelmed should a famous celebrity or world leader walk in their front door, but for Elizabeth there could have been nothing more momentous than the pregnant mother of the Messiah – carrying Him within her – entering her home. The Holy Spirit imparts to Elizabeth the gifts of knowledge and understanding, and she, who is full of good will and faith, is enlightened as to the meaning of what is occurring (Lk 1:42). Archbishop Goodier notes that “… throughout His life the one desire of Jesus was that He should be discovered; that He should be discovered, and recognized, owned. For every step made in that discovery He was grateful; no man made it but met with reward overflowing. The one thread of interest running through the whole drama of His life is the growth of this discovery.”( The Public Life of Our Lord Jesus Christ, Vol. One) Unborn John and his mother Elizabeth share in this first discovery together, as if to remind us all that the first place Jesus should be discovered is in the family. Consider the astounding words of Elizabeth which introduce, for the first time, two titles: the title “Lord” to describe unborn baby Jesus, and the title “Mother of (the) Lord” to describe Mary. For Elizabeth this was a bittersweet time. Her husband was still distressed at having doubted Gabriel: as his wife, she was yoked to his troubled thoughts and sad countenance. With whom could she share her joy? To whom could she vent her anxieties about her son’s childhood, and from whom could she receive encouraging words in return? Who could understand her situation and nurture hope in her new mother’s heart? And who could lift the spirits of her husband? Enter Mary: her young faithful heart near exploding with the Holy Spirit and the exuberant joy of miraculous motherhood and intimate knowledge of the Messianic mission. Mary’s companionship and support were a great blessing for Elizabeth. But more important than Mary, the unborn Lord arrives with His divine companionship. Now Elizabeth could pour out her heart…..and then listen with a renewed heart as the Word spoke to her. Conversations had been banished from her house and silence had been a constant companion, but now the very Word of God Himself came in through the front door and dwelt in the center of her home. Condensed from Unborn Jesus Our Hope. Todays word is all about miracles. This particular one has always been very inspirational to me. It’s also a reminder of the everyday miracles. I work with recovering alcoholics and I am one myself. To see people overcome such a debilitating illness, to be re-united with family and loved ones and to see people from all walks of life be spiritually healed on a daily basis through God’s love for us is truly awesome. Sometimes I lose sight of this. He performs small miracles everyday. Thankyou for the reminder. God bless you all. The Visitation was such an ordinary and beautiful event. We all need to be reminded (myself included) that Jesus comes to us in the everyday events of life.Many times He is hidden as in the womb of Mary but if we open ourselves to His grace we will be able to find Him. God bless you for the work you do.